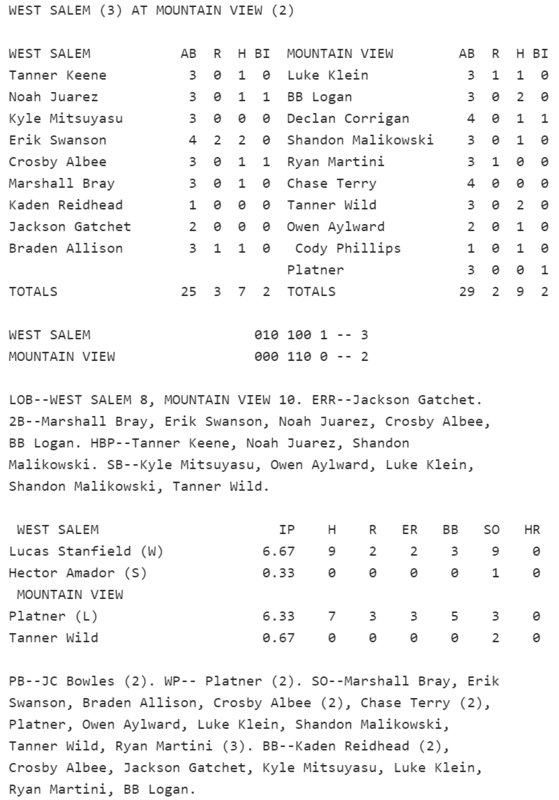 ​Game Rundown: West Salem did just enough to defeat host McNary. In the first meeting between the schools this season, it seemed as though the team to score last would win. Each team gifted the other several opportunities, as West made two errors and McNary committed four. 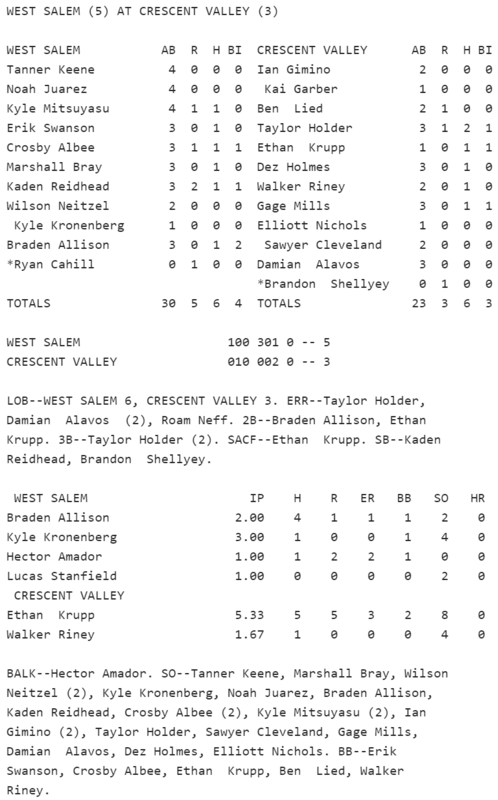 Neither starting pitcher was particularly sharp, as West's Braden Allison and McNary's Rennick Jefferies each allowed four earned runs. The game was back and forth for the better part of five innings. West struck immediately with two in the first, while McNary answered back with three of their own in the bottom of the inning. The seesaw battle would continue until the top of the fifth, when Kyle Mitsuyasu scored the go-ahead run breaking a 5-5 tie. Hector Amador and Lucas Stanfield were stellar in relief, as neither would yield a run in their combined 3 2/3 innings of relief pitching. Inside the Numbers: Crosby Albee collected the tougher half of a cycle, mashing a triple and a home run. Four Titans collected two hits in the game. 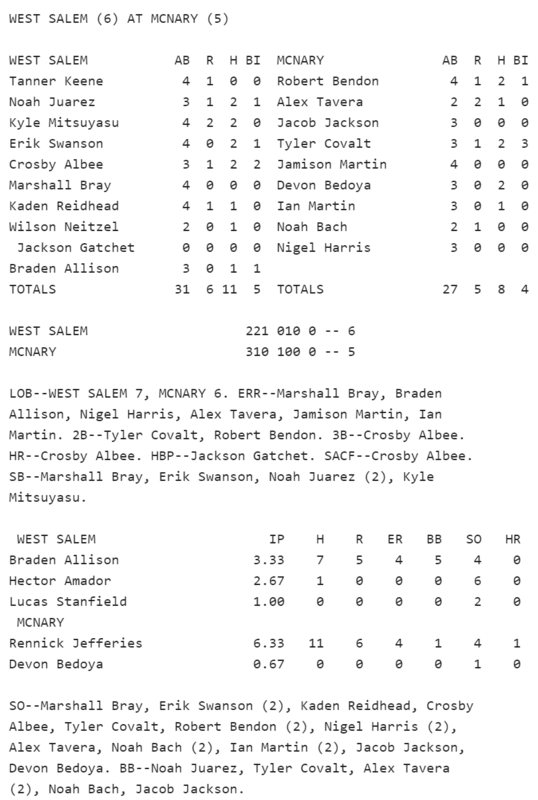 West outhit McNary 11-8, with seven of nine Titan starters getting at least one base knock. Lucas Stanfield and Hector Amador combined to allow just one hit and no earned runs in relief, while striking out eight. Up Next: West has a bit of a break before traveling to Mountain View (Bend) on Saturday, April 20th for a doubleheader. This will be the first league match-up between the teams in either school's history. The Titans currently sit at 9-4 (2-1 in league) with a state ranking of #10, while Mountain View is 4-7 (0-3 in league) with a state ranking of #43. 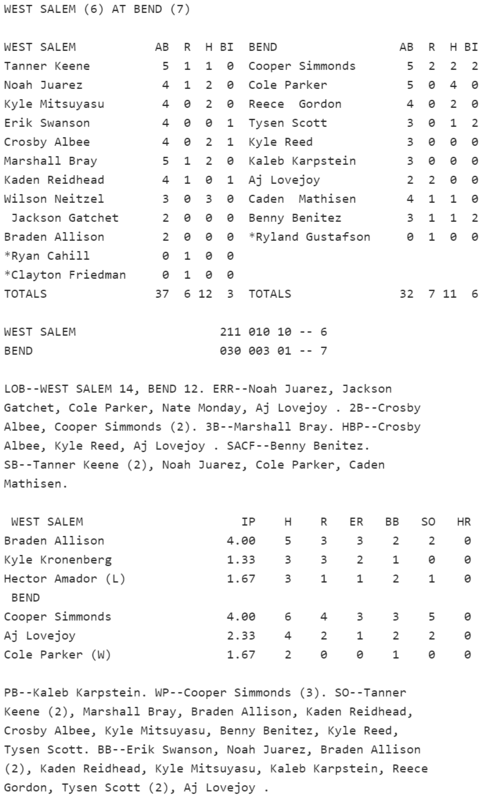 Game Rundown: The second game of a doubleheader between West and Bend was an exciting one. The Titan bats started off hot, as they scored in four of the first five innings. In fact, the Titans never trailed in the game until the sixth inning. On the mound the combination of Braden Allison, Kyle Kronenberg, and Hector Amador manged to keep the Bend Lava Bears at bay for most of the game. In the end, the Lava Bears were able to put together one to many rallies for the Titans to handle. Offense was certainly on display in game two of the double dip as West collected twelve hits and Bend eleven. The Titans seemed primed for a two game sweep after grabbing 5-3 lead after five innings. However, just as the Titan offense was cooling down (West would score only one more run) the Lava Bears bats took to hacking. In the bottom of the 6th, Bend used a three run rally to take a 6-5 lead. West would answer with one in the 7th on a wild pitch and send the game to extra innings. In the bottom of the 8th Bend loaded the bases and Lava Bears first baseman, Tysen Scott, drove a single through the right side of the infield for the walk-off win. Inside the Numbers: Although losing, West outhit Bend 12-11. Each team left a small village on the bases (West 14, Bend 12). Bend managed victory despite committing four errors. Five Titan players accrued multi-hit games, including Wilson Neitzel's 3-hit game. Up Next: West is scheduled to head to McNary on Tuesday, April 16th. Game Rundown: Lucas Stanfield was on top of his game and the Titan offense did just enough to take game one of Friday's doubleheader vs. Bend High School. Stanfield was dominant from the get-go and the Bend Lava Bears did little to slow down him down. Lucas threw a complete game shutout, while allowing only three hits and striking out ten. The victory pushes Stanfield's record to a spotless 5-0 on the year. With West's starting pitcher taking care of business on the bump there was little need for much in the way of offensive support. Of course, they would need at least one run! Crosby Albee took care of that in the top of the 4th inning when he launched a two run blast into the Bend sky. Adding a bit of insurance, Jackson Gatchet would plate a third runner for West with a sacrifice fly in the 6th. Inside the Numbers: Bend only managed to get one runner past first base in the game and that came in the final inning when Reece Gordon reached third. At one point Stanfield retired 11 straight Bend hitters. West outhit Bend 7 to 3. The Titans could've been a bit more efficient offensively, as they left seven runners on base in the game. Up Next: West will play this exact same team about 30 minutes (and 50 Subway sandwiches) after the end of game one. 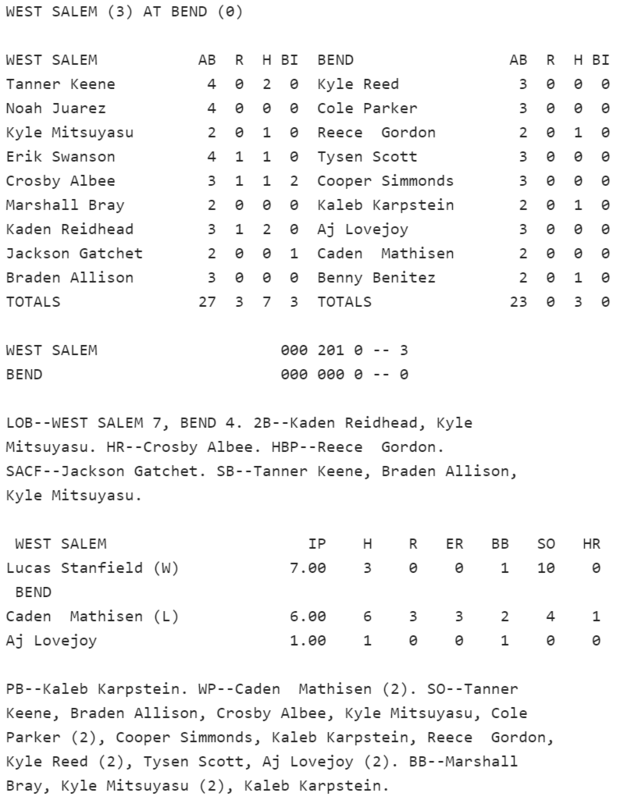 Game Rundown: West Salem used clutch hitting and solid pitching from Johnny Wholestaff to defeat the OSAA 5A's top ranked team, Crescent Valley, on Tuesday. In a game featuring two postseason contenders, the Titans managed to limit their mistakes and take advantage of the Raiders' miscues. West landed the initial blow of the game in the top of the first when Crosby Albee singled home Kyle Mitsuyasu. In the bottom on the first CV's Taylor Holder hit a missile of the center field wall, but was thrown out at home trying to extend his triple into an inside-the-park home run. The Raiders plated their first run in the bottom of the second to even up the game. The Titans answered right back, scoring three in the top of the third. The big hit came from Braden Allison, when he scored a pair on a two out double to left-center field. On the mound, West used four pitchers in the non-league affair. Braden Allison started on the mound going two innings, Kyle Kronenberg followed with three innings, then Hector Amador and Lucas Stanfield each pitched one inning to close out the game. 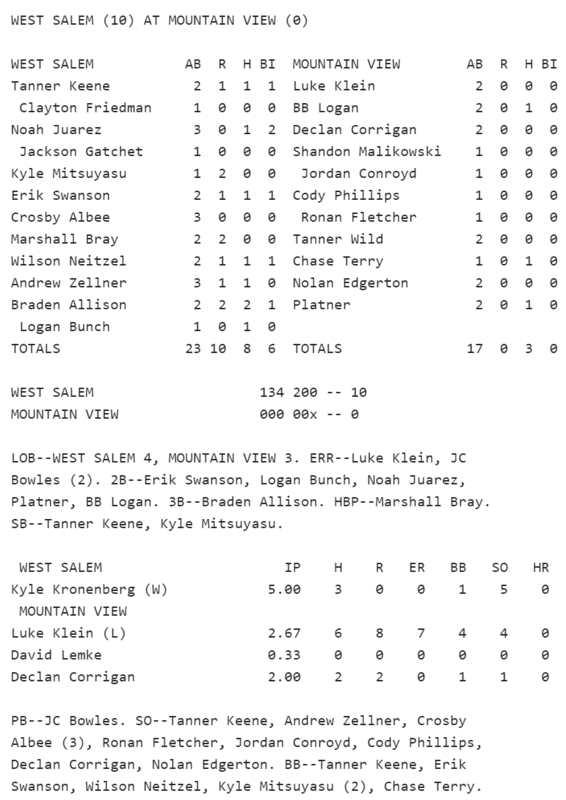 West Salem's four pitchers combined to allow only 3 runs on six hits, while striking out eight Raiders. Inside the Numbers: The Titans and the Raiders had the same amount of hits (6) in the game. CV didn't do themselves any favors, committing 4 errors in the game. 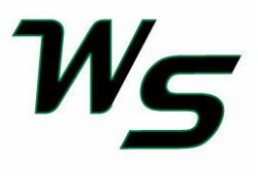 Up Next: West travels to Bend High School on Saturday, April 12th for a doubleheader. The games will begin at noon. The will be the first ever league match-up between the Titans and the Lava Bears. Bend, along with Summit, and Mountain View joined West's league at the beginning of the school year.